Open the visual editor or 2017 wikitext editor on a page on Wikidata. Click on the help button near the top right of the editor. Click on "Leave feedback about this software"
The dialogue in question says throughout that it's going to leave the feedback at VisualEditor/Feedback on wikidata.org, which doesn't exist. However, this is merely a display glitch, as the feedback is correctly posted on VisualEditor/Feedback on mediawiki.org as expected. Jdforrester-WMF added projects: VisualEditor, VisualEditor-MediaWiki, MediaWiki-General-or-Unknown. Is this about https://phabricator.wikimedia.org/T92661#1986528, and does this mean I won't have to fix stuff manually? Thanks. the feedback from any wiki actually ends up in mediawiki.org anyway. I'm guessing the patch will mean both will be fixed. I'm learning that part 2 is fixed in T125850 . Elitre added a subscriber: jeblad. Jdforrester-WMF added subscribers: Shizhao, Stryn, Cosine02. I've updated this task to reflect the current state of affairs. As this is only a display glitch, I am decreasing priority. This appears to be unrelated to this task. The feedback tool pastes the user agent of the user into the feedback, and that didn't happen here. 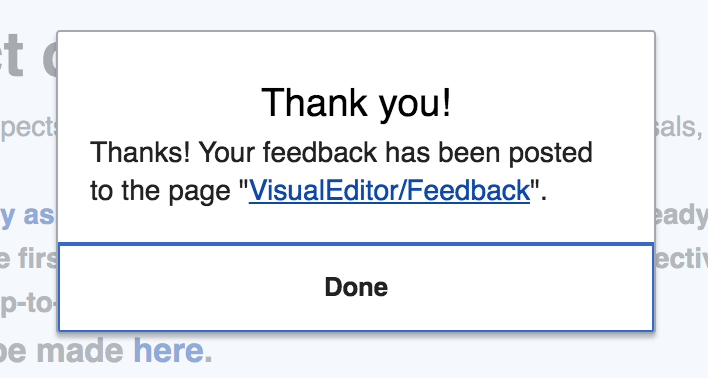 I don't know how or why the user thought to leave that feedback there, but it wasn't through the visual editor itself, so it is outside the scope of this task. @Deskana this is "just" patch to review IIUC, and I'm moving forward with the centralisation process (T162664) for which it will be useful. Currently the tool posts in the correct place, but does provide links (before and after using it) to a non-existent page in the main namespace, VisualEditor/Feedback. If the link at least pointed to WP:VisualEditor/Feedback instead (which exists on several projects, on most being a redirect), people wouldn't be entirely lost as to what happened to what they wrote (which obviously doesn't even show up in their local contribs). The current patch is a bit broken/incomplete, but it's the right approach. I'll finish it up. Jdforrester-WMF moved this task from Freezer to TR1: Releases on the VisualEditor board. Jdforrester-WMF changed the point value for this task from 8 to 1.